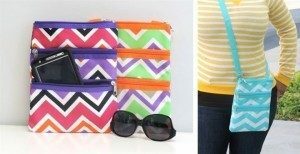 Chevron Cross Body Messenger Bag Only $7.99! You are here: Home / Great Deals / Chevron Cross Body Messenger Bag Only $7.99! Check out this great bag that is perfect for all those summer days running errands out and about. Chevron Cross Body Messenger Bag Only $7.99! Choose from 11 hot colors perfect for Spring & Summer!